Staphylococcus aureus is an important foodborne pathogen. Lactococcus garvieae is a lactic acid bacterium found in dairy products; some of its strains are able to inhibit S. aureus growth by producing H2O2. Three strains of L. garvieae from different origins were tested for their ability to inhibit S. aureus SA15 growth. Two conditions were tested, one in which H2O2 was produced (high aeration) and another one in which it was not detected (low aeration). Several S. aureus genes related to stress, H2O2-response and virulence were examined in order to compare their level of expression depending on the inoculated L. garvieae strain. Simultaneous L. garvieae H2O2 metabolism gene expression was followed. The results showed that under high aeration condition, L. garvieae strains producing H2O2 (N201 and CL-1183) inhibited S. aureus SA15 growth and impaired its ability to deal with hydrogen peroxide by repressing H2O2-degrading genes. L. garvieae strains induced overexpression of S. aureus stress-response genes while cell division genes and virulence genes were repressed. A catalase treatment partially or completely restored the SA15 growth. In addition, the H2O2 non-producing L. garvieae strain (Lg2) did not cause any growth inhibition. The SA15 stress-response genes were down-regulated and cell division genes expression was not affected. Under low aeration condition, while none of the strains tested exhibited H2O2-production, the 3 L. garvieae strains inhibited S. aureus SA15 growth, but to a lesser extent than under high aeration condition. Taken together, these results suggest a L. garvieae strain-specific anti-staphylococcal mechanism and an H2O2 involvement in at least two of the tested L. garvieae strains. Staphylococcus aureus is an opportunistic human pathogen that can be responsible for food poisoning . Its pathogenic activity is due to the production of various enzymes and toxins. It can be found in different environments including milk and dairy products . In cheese, its level should not exceed 105 CFU.g− 1 (European Community Regulation No. 852–853/2004). Lactococcus garvieae is an ubiquitous LAB (Lactic Acid Bacteria) that can be found in various fermented foods including dairy products [3, 4], in fish, ruminant or human microbiota  and can be associated with pathologies such as fish lactococcoses [6, 7]. LABs such as Lactococcus lactis or Lactococcus garvieae are able to inhibit the proliferation of pathogens in cheese by the production of hydrogen peroxide , bacteriocins , by competition for nutrients [10, 11] or by acidification of the medium [12–14]. Depending on its concentration, hydrogen peroxide has a bactericide or a bacteriostatic effect on S. aureus . L. garvieae raises our interest because a specific dairy strain of this LAB, N201 strain, can inhibit S. aureus growth by the production of H2O2 [2, 16, 17]. Moreover, it has a strong technological potential as a ferment for cheese production  and has almost no effect on acidification of the medium, compared to other LABs . The inhibitive properties of L. garvieae N201 were confirmed on 2 strains of S. aureus: a human pathogenic strain, MW2  and a non-pathogenic dairy strain, SA15, isolated from Saint-Nectaire cheese . Delpech et al. showed that S. aureus had no effect on L. garvieae growth and H2O2-related gene expression. On the contrary, L. garvieae N201 impaired the capacity of both strains of S. aureus to deal with the presence of H2O2 which led to growth deficiency [2, 16, 17]. In order to investigate the interaction between S. aureus and L. garvieae in oxidative stress-inducing culture conditions, genes involved in H2O2 metabolism were first choice targets, whose expression has been monitored by Delpech et al. [17, 20] in co-cultures of L. garvieae N201 and S. aureus SA15 or MW2. In L. garvieae, superoxide dismutase sodA [21, 22] and pyruvate oxidase poxB genes [23, 24] are involved in H2O2 synthesis. As they do not have any catalase, LAB generally degrade H2O2 using alkyl hydroxyperoxidase (Ahp)  or glutathione peroxidase (Gpx) . Thioredoxine reductase (Trx) are involved in response to Reactive Oxygen Species (ROS) [27, 28]. In S. aureus, Catalase (KatA) and Alkyl hydroxyperoxidase (Ahp) play a role in H2O2 degradation [29, 30]. Ahp leads to a dual function in oxidative-stress resistance, environmental persistence and host-pathogen interaction . Amongst the targeted genes, dnaK is known to be involved in H2O2-resistance [31, 32], clpC has an important role in oxidative stress regulation, and ctsR is a transcriptional repressor of stress-genes . Moreover, the 2 latter genes, belonging to the dcw cluster involved in cellular division, might be modulated by H2O2-stress, leading to S. aureus growth impairment . So, if LAB can modify this genes cluster expression, it could have an inhibiting effect on cellular division. In addition to S. aureus growth modulation, L. garvieae may also have an effect on its virulence. Enterotoxins are the main toxins responsible for S. aureus food poisoning. Ninety-four per cent of S. aureus isolated from cow milk have at least one enterotoxin-encoding gene . Amongst the different enterotoxins, enterotoxin C, encoded by sec4 gene, is the most frequently involved in food poisoning [36–39]. Cretenet et al. showed that this virulence-related gene expression can be modified by L. lactis in cheese. S. aureus virulence is under control of the agr system which is involved in regulating many stress response and virulence genes [41–43]. agrA is a response regulator  and is able to induce hld, a δ-lysin gene , and enterotoxin C encoding gene sec4 . The agr system itself is controlled by several molecular intermediates such as SaeRS and SrrAB. SaeRS is a two-component system involved in response to environmental stress which could inhibit agr system  and also control virulence genes [47–50]. SrrAB is also a two-component system activated in an anaerobic environment . It would be involved in virulence gene control  in response to H2O2. Indeed, in the presence of H2O2, srrA is repressed in S. aureus . Under anaerobic conditions, SrrA represses agrA and hld expression [54, 55]. CodY, a regulatory protein involved in repressing virulence gene expression in S. aureus, is also involved in controlling agr system and virulence genes . The level of aeration can change the level of H2O2-production according to the LAB strain. Indeed, it has been demonstrated that the transcriptomes of L. lactis and L. garvieae are significantly modified by the aeration level [20, 57]. Lactobacillus crispatus can produce H2O2 in high aeration conditions but not in static conditions . Contrariwise, Lactobacillus delbrueckii subsp. bulgaricus can also produce H2O2 in static conditions, even though the amount produced is lower than in high aeration conditions . The aim of the present study was to compare the transcriptional response involved in the antagonistic interaction between S. aureus and different strains of L. garvieae. In addition to N201 strain isolated from raw milk Saint-Nectaire cheese and already well described [2, 16], two other L. garvieae strains were selected for their different capacities to produce H2O2: a H2O2 -producing strain, CL-1183 (VIVASET, Veterinary Faculty, Complutense University from Madrid) isolated in Brazil from the milk from buffalo cows affected by subclinical mastitis  as well as a H2O2-non producing strain, Lg2, a fish pathogenic strain isolated in Japan . The expression of S. aureus genes related to oxygen metabolism, response to stress, cell division and virulence was measured as well as the expression of L. garvieae genes related to oxygen metabolism. In order to investigate the interaction between S. aureus and L. garvieae in oxidative stress-inducing culture conditions, we followed the growth of the strains and measured the amount of H2O2 in two culture conditions i.e. under high and low aeration levels. The genes whose expression has been monitored by Delpech et al. [17, 20] were chosen to compare the transcriptional response involved in the antagonistic interaction between S. aureus and different strains of L. garvieae. The expression of S. aureus genes related to oxygen metabolism, response to stress, cell division and virulence was measured as well as the expression of L. garvieae genes related to oxygen metabolism (Table 1). The effect of aeration level on microbial growth was tested by determining cellular concentrations of both microorganisms. In pure culture, S. aureus growth was almost identical under both high and low aeration conditions. However, the population count reached at 24 h was 1.2 log CFU/ml lower under low aeration than under high aeration (Fig. 1a). The 3 different strains of L. garvieae grew as well under high aeration level as under low aeration level independent of the presence of S. aureus (Additional file 1). pH values remained stable (7.0 ± 0.2) in all cultures over the whole experiment (data not shown). Detectable amounts of H2O2 were produced exclusively under high aeration level by N201 and CL-1183 strains in co-culture with SA15. N201 strain produced from 1.327 mM ± 0.09 to 1.517 mM ± 0.18 of H2O2. The strain CL-1183 produced slightly more H2O2 than the strain N201, from 1.663 mM ± 0.23 to 2.415 mM ± 0.34. While N201 H2O2-production peak was at 9 h, CL-1183 H2O2-production stayed stable after 9 h (Table 2). Under high aeration, when co-cultivated with N201, SA15 growth was 2.1 log [CFU.ml− 1] lower than in pure culture as early as 6 h with a maximal growth inhibition of 5.8 log [CFU.ml− 1] at 24 h. SA15 growth co-cultivated with CL-1183 was 1.7 log [CFU.ml− 1] lower compared to pure culture as early as 6 h. The maximal growth inhibition was observed after 24 h of co-culture (4.5 log [CFU.ml− 1] lower). SA15 co-cultivated with Lg2 did not show any significant impairment in growth throughout the experiment compared to pure culture (Fig. 1a). Under low aeration level and in co-culture with N201, CL-1183 or Lg2, SA15 growth was lower than in pure culture as early as 6 h (0.6 log [CFU.ml− 1], 0.9 log [CFU.ml− 1] or 0.6 log [CFU.ml− 1], with a maximal growth inhibition at 24 h (2.5 log [CFU.ml− 1], 3.5 log [CFU.ml− 1 or 1.6 log [CFU.ml− 1]], respectively) (Fig. 1a). To determine the involvement of H2O2 produced by N201 and CL-1183 in growth inhibition of SA15, co-cultures of SA15 with these 2 strains were performed under high aeration level in presence of catalase (Fig. 1). No detectable amount of H2O2 was observed at any time. S. aureus cell concentration was not significantly different in presence of catalase compared to control (Fig. 1) during both exponential and stationary phases. Statistical analysis, using ANOVA, showed that in presence of catalase there was no significant difference of SA15 count after 24 h in co-culture with CL-1183 compared to pure culture. In contrary, SA15 cell concentration in co-culture SA15/N201 was still 0.8 log [CFU.ml− 1] lower than in pure culture. These results showed that the inhibition of SA15 growth by N201 and CL-1183 was partially or completely suppressed by catalase. Whatever the L. garvieae strain cultivated with SA15, none of the H2O2-response genes tested was up-regulated. When SA15 was cultivated with L. garvieae N201 or CL-1183, katA was down-regulated, at 9 h and 24 h with N201 (3.7 and 3.0-times, respectively), or at 6 and 9 h with CL-1183 (3.9 and 3.2-times, respectively). When cultivated with N201, ahpF expression in SA15 was not modified in comparison with pure culture, whereas in co-cultures SA15/CL-1183 and SA15/Lg2, it was down-regulated (2.1-times at 6 h and 2.9-times at 24 h, 6.9-times at 24 h, respectively). sodA was down-regulated at 6, 9 and 24 h in co-cultures with N201 (2.2, 4.4 and 3.9-times, respectively) or at 24 h (2.2-times) with CL-1183. No change in expression of katA and sodA was observed with Lg2. L. garvieae N201 induced an up-regulation of the three SA15 stress-response genes tested at 9 h; clpC, ctsR and dnaK were 2.0-times, 3.7-times and 2.5-times more expressed than in pure culture, respectively. When cultivated with CL-1183, only dnaK was 2.8-times up-regulated at 6 h, while clpC and ctsR expressions were not affected. Conversely, in co-culture SA15/Lg2, clpC and dnaK were 3.9-times and 19.8-times down-regulated respectively, while ctsR did not show any significant difference in its expression. In both SA15/N201 and SA15/CL-1183 co-cultures, mraW cell division gene was strongly down-regulated at 6 and 9 h (7.0-times and 20.3-times, and 20.0-times and 12.0-times, respectively). In co-culture SA15/Lg2, mraW expression was not affected. In co-culture, the five SA15 virulence-related regulator genes tested displayed contrasted patterns of expression. At 9 h, in both SA15/N201 and SA15/CL-1183 co-cultures, agrA was up-regulated (4.0-times with N201 and 3.4-times with CL-1183), while srrA was down-regulated (7.1-times or 6.4-times with N201 or CL-1183 respectively). codY expression was down-regulated 4.1-times at 24 h by N201 and 3.6-times at 6 h by CL-1183. saeS expression was 2.4-times lower at 24 h in co-culture with N201 than in pure culture, whereas it was not affected by CL-1183. hld expression remained stable until 24 h when SA15 was in co-culture with N201 or CL-1183. In co-culture SA15/Lg2, at 24 h, agrA, codY and hld expressions were all down-regulated (3.0-times, 2.6-times and 3.9-times, respectively), while saeS and srrA expressions remained stable. In co-cultures SA15/N201 and SA15/CL-1183, amongst the 2 enterotoxins-encoding genes tested, only sec4 expression was modified at 24 h, with a 4.1-times and a 9.0-times down-regulation, respectively. sel2 expression was not modified whatever the SA15 culture conditions were. In co-culture SA15/Lg2, no enterotoxin gene expression was affected. Under low aeration level, in presence of CL-1183, the H2O2-response gene ahpF was 4.2-times up-regulated at 9 h, whereas in presence of Lg2, sodA was 6.5-times down-regulated at 24 h. All the stress-response genes tested were up-regulated at 9 h (3.4-times for clpC, 4.0-times for ctsR and 2.1-times for dnaK) with Lg2. No change in stress-response genes expression was observed when SA15 was cultivated with N201 or CL-1183. Concerning the cell division gene mraW, its expression was not modified, whatever the strain cultivated with SA15. Amongst virulence-related regulator genes, agrA was up-regulated in all three co-cultures at different stages of growth. It was the only virulence-related regulator gene differentially regulated by N201 (6.0-times up-regulated at 9 h). In the same way, this gene was 4.1-times up-regulated at 9 h by CL-1183, and 2.5-times up-regulated at 24 h by Lg2. codY was 2.0-times down-regulated at 6 h but 2.0-times up-regulated at 24 h with CL-1183, while codY and srrA were 2.1- and 2.7-times down-regulated at 9 and 24 h, respectively with Lg2. The enterotoxin gene sec4 was up-regulated in both N201/SA15 and CL-1183/SA15 co-cultures, (3.5- and 2.7-times, at 6 and 9 h respectively, with N201, and 2.5-times at 9 h with CL-1183). sel2 was 3.5-times up-regulated at 9 h only in the presence of CL-1183. To evaluate the strain-specific effect of aeration on L. garvieae, expression of 5 H2O2-related genes of them (trxB1, ahpC, gpx, poxB and sodA) was monitored and compared between the 3 L. garvieae strains in co-culture with SA15. Overall, most differential expressions concerned H2O2-degradation genes. Differences between H2O2-producing and non-producing strains were essentially related to ahpC: both N201 and CL-1183 overexpressed this gene under low aeration (5.6-times at 24 h in N201, 4.0-times at 6 h and 6.5-times at 9 h in CL-1183). Conversely, Lg2 overexpressed ahpC (4.7-times) at 9 h under high level of aeration. Both CL-1183 and Lg2 overexpressed trxB1 under high level of aeration (2.9-times at 6 h in CL-1183 and 2.1-times 24 h in Lg2). Amongst H2O2-synthesis genes, only CL-1183 overexpressed poxB (4.1-times at 9 h under low aeration). The aim of the study was to compare the transcriptional response involved in the antagonistic interaction between S. aureus and different strains of L. garvieae. Three strains of L. garvieae from different origins were used: N201, a dairy-isolated strain known to be a S. aureus inhibiting strain; CL-1183, a strain isolated from milk from buffalo cows suffering from mastitis; and Lg2, a fish pathogenic strain. Under high aeration condition, two of them were shown to be able to produce detectable amount of H2O2 (N201 and CL-1183), whereas the third one (Lg2) was not. Under high aeration level, only L. garvieae N201 and CL-1183 inhibited S. aureus growth. CL-1183 down-regulated S. aureus H2O2-degradation genes (ahpF and katA) and N201 and Lg2 only down-regulated katA or ahpF respectively. This could mean that SA15 lost its ability to deal with H2O2-stress and suggest that the H2O2 detoxification occurred predominantly via KatA. These results are in accordance with those obtained by Cosgrove et al. , showing that S. aureus ahpC-katA mutant was no more sensitive to H2O2 than the katA mutant. They also found out that, Ahp would have less affinity for H2O2 than KatA and that it could be an alternative solution for H2O2-degradation when KatA was not functional. In our study, despite N201 only down-regulated katA and not ahpF, AhpF did not play its compensatory role in H2O2 detoxification. This result can be explained by the fact that KatA was responsible for detoxifying high levels of H2O2, whereas AhpC was responsible for the removal of low levels of H2O2 . This could be correlated with the large amounts of H2O2 detected in the co-cultures SA15/N201. The down-regulation of katA, at 9 h and 24 h, can be explained by the fact that srrA was also down regulated. Mashruwala and Boyd  found that srrAB mutant strain had decreased transcription of genes encoding for H2O2 resistance factors as katA. They also reported that SrrAB positively influenced H2O2 resistance during periods of high O2 dependent respiratory activity, but not when cellular respiration was diminished as a result of lower O2 availability. S. aureus SA15 genes involved in stress-response (clpC, ctsR, dnaK) were all up-regulated by N201 and only dnaK was up-regulated by CL-1183, whereas clpC and dnaK were down-regulated by Lg2. These results indicated that in presence N201 and CL-1183, SA15 detected an oxidative stress as a result of H2O2 production by these two L. garvieae strains. However, the up-regulation of these genes did not allow SA15 to fight against this stress, although precedent studies reported that S. aureus clpC or dnaK mutants growth was impaired in the presence of H2O2 stress [32, 62, 63] and that a basic level of expression of dnaK was sufficient in response to this stress . All these data highlighted the complexity of the stress response machinery and the important role of clpC, ctsR and dnaK genes. Moreover, while mraW gene was not differentially expressed in presence of Lg2, it was repressed at 6 and 9 h by N201, confirming results obtained by Delpech et al. , and by CL-1183 in our study, when S. aureus growth was inhibited. The repression of mraW by N201 and CL-1183 was positively correlated with inhibition of SA15 growth. These results are supported by Cretenet et al. showing that L. lactis was able to inhibit ftsH, ftsL and ftsZ genes also involved in cellular division. Interestingly, several studies reported that inhibition of cell division protein is a promising approach for anti-staphylococcal therapy [64, 65]. 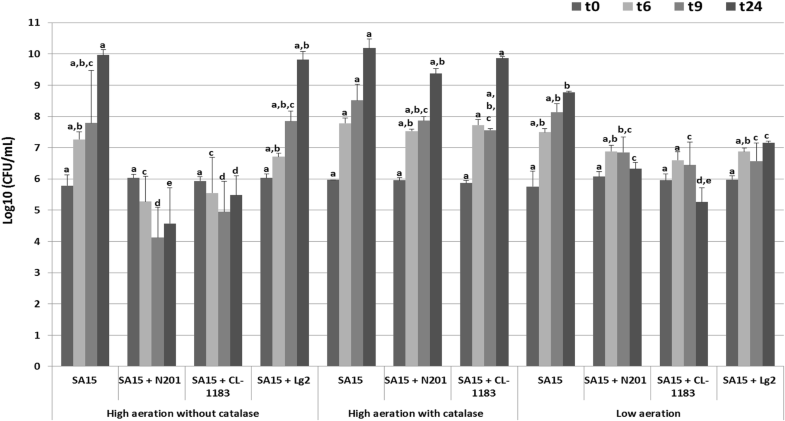 Catalase treatment partially reduced SA15 growth inhibition by N201, confirming the result obtained by Delbes-Paus et al. , whereas the inhibition by CL-1183 was completely suppressed. Oogai et al. observed that in presence of catalase, the S. aureus MW2 growth inhibition by Streptococcus sanguinis was completely suppressed. These observations confirmed the role of H2O2 produced by LAB in growth inhibition of S. aureus. Our study demonstrated that under high level of aeration, the inhibition of S. aureus by L. garvieae involved strain specific mechanisms. Indeed, CL-1183 inhibited SA15 growth mainly by H2O2 production whereas inhibition due to N201 may involve the combined action of H2O2 and other antagonistic mechanism. Under low aeration condition, S. aureus growth was almost identical to that measured under high aeration condition, except after 24 h, when we observed a 1,2 log reduction in the S. aureus population level that could be due to the depletion of oxygen. Ledala et al. showed that the growth rate of S. aureus was independent of oxygen limitation over 12 h although its metabolome was significantly affected. S. aureus growth was slightly inhibited by the three L. garvieae strains, although none of them could produce detectable amounts of H2O2 (Fig. 1). This suggests that there was another inhibitory mechanism involved. These results match those obtained with N201 in the previous studies [2, 17, 20]. Delbes-Paus et al. have shown that in milk, even if H2O2 was not detected, S. aureus growth was inhibited by L. garvieae N201. However, no clear hypothesis to explain the mechanism of the anti-staphylococcal activity under low aeration could be drawn from the gene expression data. However, the up-regulation of stress-response genes in the presence of Lg2 was observed. Indeed, clpC, ctsR and dnaK genes, were all up-regulated at 6 h in co-culture with Lg2, suggesting that Lg2 triggered a stress on SA15 which led to a growth inhibition. Under high level of aeration, L. garvieae N201 reduced S. aureus virulence-related genes expression confirming results obtained by Delpech et al. . Cretenet et al. and Queck et al. have shown that the agr system, involved in the regulation of genes linked to S. aureus virulence, was repressed by L. lactis even if L. lactis does not produce H2O2 in this condition. Molecular intermediaries SaeRS and SrrAB are involved in controlling the agr system . We showed srrA expression was repressed in co-culture with N201 and CL-1183, when H2O2 was produced as already observed by Chang et al. . Moreover, Majerczyk et al. have shown that a codY mutant could derepressed agr system. In our conditions, codY was repressed by CL-1183 at 6 h explaining agrA up-regulation at 9 h, whereas repression of codY at 24 h by Lg2 cannot explain agrA down-regulation suggesting that another regulator might be involved. Moreover, at 24 h, despite SA15 growth was not modified, Lg2 caused a down-regulation of three virulence-related regulator genes tested in this study (agrA, codY, hld). sec4 and sel2 are two enteroxin-encoding genes found in S. aureus SA15 . Although enteroxin C-encoding gene sec4 is under the control of the agr system , agrA expression was only induced by N201 and CL-1183 and sec4 was repressed under high aeration level as shown by Delpech et al. . Our data showed the repression of virulence associated genes and of enterotoxin encoding genes as well as simultaneous S. aureus growth inhibition in the presence of N201 or CL-1183, indicating that these 2 strains not only inhibited SA15 growth but also potentially attenuated its virulence. Under low aeration condition, S. aureus over-expressed agrA and enterotoxin-encoding genes sel2 and sec4 in presence of N201 and CL-1183, whereas Lg2 did not induce any modification. In presence of Lg2, agrA was up-regulated at 24 h. This result can be explained by the fact that SA15 srrA gene was down-regulated, at the same time. The same observation was reported by Yarwood et al. . They showed that transcription of RNAIII from the agr locus was inversely dependent on expression of srrAB. Inherently, despite SA15 agrA up-regulation by Lg2, no modification in enterotoxin genes expression was observed. Yarwood et al. also reported that the SA15 srrB mutant growth was significantly slower in anaerobic condition, which is in accordance with SA15 growth inhibition in presence of Lg2. It seemed that the three strains of L. garvieae differed essentially in their ability to degrade H2O2. Presence of H2O2 would not depend only on H2O2-synthesis, but also on H2O2-degradation by L. garvieae strains, which is an original mechanism, and in accordance with the results obtained by Delpech et al. . In high aeration level, Lg2 overexpressed two H2O2 degradation genes ahpC and trxB at 9 and 24 h respectively. The non-detection of H2O2 could be explained by the absence of production of H2O2 or by its degradation by AhpC and TrxB. The latter mechanism could explain why, under low aeration, despite CL-1183 overexpressed an H2O2-synthesis gene, poxB, no detectable H2O2 was observed. Indeed, at the same time, this strain overexpressed the H2O2 degradation gene ahpC. Our data showed that the importance of the inhibition varies depending on the presence or absence of H2O2. Indeed, inhibition can occur while H2O2 is not detected. As regards other potential explanations for the growth inhibition, the only putative bacteriocin identified in the L. garvieae N201 genome was homologous to garvieaecin Q (GarQ, data not shown), a class IId bacteriocin . In view of the results of previous experiments on L. garvieae N201 , the inhibition was probably caused neither by garvieaecin Q nor by a protein, nor by a lipid, and nor by a polysaccharide. In the present study, we evidenced L. garvieae strain-specific response in S. aureus gene expression which suggests that molecular mechanisms involved in the inhibition could differ between L. garvieae strains. Further investigations are needed to elucidate these mechanisms. A detailed analysis of strains physiology is needed to evaluate the potential role of nutritional competition in the inhibition. A global transcriptomic approach of the interaction would shed some light on the metabolic dialogue between these strains, and more particularly the potential involvement of quorum-sensing. Our data evidenced an impact of the aeration condition on the interaction between SA15 and L. garvieae strains. Under high level of aeration, only N201 and CL-1183 produced detectable amounts of H2O2 and consequently inhibited SA15 growth. Both L. garvieae strains activated SA15 stress-response genes and inhibited the expression of several genes involved in H2O2-degradation, virulence and cellular division. A catalase treatment partially or completely suppressed this inhibition and no H2O2 was detected. Lg2 strain did not produce any detectable amount of H2O2 and did not inhibit SA15 growth. However, as N201 and CL-1183, Lg2 inhibited SA15 virulence-related genes and stress-response related genes. Under low aeration level, none of the L. garvieae strains produced any detectable amount of H2O2. N201 and CL-1183 were still able to inhibit SA15 growth, as well as, Lg2. While N201 and CL-1183 induced the up-regulation of the SA15 enterotoxin-encoding genes and related regulator agrA, Lg2 caused up-regulation of SA15 stress-related genes and down-regulated virulence-related regulators genes. The antagonistic properties of L. garvieae against S. aureus were strain- and aeration level-dependent. Under high aeration, they involved H2O2 production by two out of the three L. garvieae tested strains. This study provides new insights into microbial interactions mechanisms and shows the importance of investigating strain-specific effects. Strains Lactococcus garvieae N201, CL-1183 and Lg2 and Staphylococcus aureus SA15 were cultivated in Brain-Heart Infusion buffered to pH 7 using Potassium Phosphate (BHI, Biokar Diagnostic, Pantin, France) at 30 °C and 37 °C, respectively, under static condition. After 20 h, cells were harvested at 3500 g during 15 min. Cell pellets were resuspended in 2 ml of BHI and syringed 5 times. Cell concentration was then determined using a Petroff-Hausser counting chamber. Fifty milliliters of buffered BHI, containing or not 4000 IU ml− 1 of catalase from bovine liver (ref. C100, Sigma), were then co-inoculated at ~ 107 cells per ml for L. garvieae and ~ 106 cells per ml for S. aureus, or just with L. garvieae or S. aureus at the same concentration in 250 ml Erlenmeyer flasks or in 50 ml Falcon tubes, as described previously [2, 17]. Then, Erlenmeyer flasks were incubated for 6, 9 or 24 h at 30 °C under shaking condition (150 rpm), corresponding to the high level of aeration condition. The low level of aeration condition corresponded to static fully filled 50 ml Falcon tubes. At 0, 6, 9 and 24 h, 1 ml of the cultures was removed to be syringed and serially diluted in Ringer’s solution. After adequate mixing, 100 μl of each dilution were plated onto solid Baird Parker for S. aureus and BHI agar for L. garvieae for numeration. Colony-forming units were counted after overnight incubation at 37 °C for S. aureus and 30 °C for L. garvieae. Also, 1 ml was removed from the cultures for H2O2 content analysis and 40 ml for RNA extraction. Cell pellets from 6, 9 and 24 h cultures were resuspended in 200 μl of cold Tris-EDTA buffer and then frozen at − 80 °C. The experiment was carried out in triplicate within each of three independent biological replicates, for a total of 9 samples per time point. pH measurements were made with the rest of the cultures. Hydrogen peroxide concentration was determined according to Batdorj et al. protocol  with slight modifications. Cells were harvested by centrifugation at 11500 g, 15 °C for 10 min. One hundred microliter of the sample supernatant were mixed with 100 μl of 4-aminoantipyrine 4 mg.ml− 1 (Sigma-Aldrich, St. Louis, Missouri, USA), 20 μl of water-saturated phenol (Sigma-Aldrich, St. Louis, Missouri, USA), 750 μl of phosphate buffer Na2HPO4/NaH2PO4 0.1 M (pH 7) and 30 μl of horseradish peroxidase type VI-A (500 U.ml− 1 in sodium phosphate buffer pH 6 (Sigma-Aldrich, St. Louis, Missouri, USA). Sample was mixed by inverting the tube and OD was measured at 505 nm. Blank was done by replacing sample by sterile medium. H2O2 concentration was determined using a standard curve performed with concentrations ranging from 0 to 3 mM. The minimal concentration that could be detected was 0.5 mM. Cells in Tris-EDTA buffer were thawed out and 25 μl of 20% SDS, 500 μl of phenol (pH 4), 3.5 μl of β-mercaptoethanol and 600 mg of Zirconium beads were added. The cells were broken twice in a tissue homogenizer (Precellys® 24, Bertin Technologies, Montigny-le-Bretonneux, France). Then, 200 μl of chloroform were added and mixed with the solution and sample was centrifuged at 11400 g for 20 min at 4 °C. RNA extraction was performed using NucleoSpin RNA Midi kit (Macherey-Nagel, GmbH & Co. KG, Düren, Germany) following the supplier’s instructions. The RNA extracts were treated twice with DNAse I using an Ambion DNA-free kit following the supplier’s instructions (Ambion, Inc., Austin, Texas, USA). The RNA extracts were quantified using a Nanodrop™ 2000C (Thermo Fisher Scientific Inc., Waltham, Massachusetts, USA). Reverse Transcription (RT) was performed using 0.5 μg of RNA twice treated with DNase, 5 μl of 10X buffer, 2 μl of 25X dNTP, 5 μl of random primers and 2.5 μl of retrotranscriptase (Applied Biosystems®, Life Technologies, Foster City, California, USA). The RT was done in a thermocycler (Techne® Prime, Bibby Scientific, Stone, Staffordshire, UK) with the following parameters: 10 min at 25 °C and 120 min at 37 °C. Genes Of Interest (GOI) Ct were determined in quantitative PCR (qPCR) assays using 2.5 μl of cDNA suspensions 10-fold diluted in RNAse-free water and 10 μl of qPCR mix containing 1.25 μl of each primer (10 mM, Tables 3 and 4), 6.25 μl of qPCR Rotor Gene SybrGreen mix (Qiagen, Hilden, Germany) and 1.25 μl of RNAse-free water. The qPCR was performed according to the protocol on Rotor Gene Q (Qiagen, Hilden, Germany) with the following parameters: 4 min at 94 °C, then for 35 cycles, 30 s at 94 °C, 30 s at 55 °C, 60 s at 72 °C. Each reaction was performed in triplicate within each of three independent biological replicates, for a total of 9 reactions per time point. Primers efficiencies were determined according to a 10-fold template dilution standard and were all ranging from 1.90 (~ 95%) to 2.293 (~ 115%) according to the following equation: Efficiency = 10^(− 1/slope of calibration curve) . The primers used were previously described by others . One reference gene was used for L. garvieae data: tufB encoding the elongation factor Tu. Considering that the lag in growth phase reflects the inhibition of S. aureus by L. garvieae, we evaluated gene expression at identical time points corresponding to different population levels. Two reference genes whose expression was stable over time under the different conditions were used for S. aureus data: housekeeping genes recA, encoding the recombinase A, and hu, encoding a DNA-binding protein. The GOI expression was calculated according to the formula introduced by Hellemans et al. . Differential gene expression was evaluated by comparing expression between two conditions. First, the influence of aeration on gene expression in pure culture was evaluated for S. aureus. Then, the influence of different strains of L. garvieae (N201, CL-1183 and Lg2) on S. aureus SA15 gene expression was observed under high or low aeration condition. Secondly, L. garvieae gene expression was compared between the different strains in co-culture with S. aureus SA15 under both aeration conditions. A gene was considered as differentially expressed when its expression was changed by at least a factor of 2. Statistical analyses on microbial counts were performed using R software  by one-way analysis of variance (ANOVA) followed by Least Significant Difference (LSD) test. The gene expression statistical analyses were performed using R by ANOVA with Newmann-Keuls post-hoc test. Significance was declared at P < 0.05. Céline Delbès and Stéphanie Bornes contributed equally to this work. The authors acknowledge Mr. Mar Blanco for the gift of Lactococcus garvieae strain CL-1183, as well as Masahira Hattori and Hidetoshi Morita for the gift of Lactococcus garvieae strain Lg2 and Maryline Bornes and Kate James for English proofreading. The authors of this work as well as the collection of data were supported by the University Clermont-Auvergne (IUT Clermont-Ferrand) and by the Institut national de la recherche agronomique (INRA). The funding bodies did not have any influence neither in the design of the study, in the analysis and the interpretation of data, nor in the writing of the manuscript. CQ performed the RT-qPCR, analyzed genes expression, ran statistical analyses and was a major contributor in writing the manuscript. MB contributed to cultivate the different strains, performed the quantitative analysis of H2O2 in L. garvieae cultures, the RNA extraction, DNase treatment and the RT-qPCR, and was also a contributor in writing the manuscript. TS cultivated the different strains, performed the tests with added catalase, and contributed in writing the manuscript. PD helped in RT-qPCR, genes expression analysis and improvement of the manuscript. PV contributed to cultivate the different strains and to extract the RNA. ER contributed to statistical analyses. CM contributed to the adjustment of the method of quantitative analysis of H2O2. GG read and corrected the manuscript. SB and CD conceived the study. CD contributed to genes expression analysis and to the structuring and improvement of the manuscript. SB contributed to cultivate the different strains, performed the RNA extraction and was also a contributor in writing the manuscript. All authors read and approved the final manuscript.